For the past 7 years Baymard’s research findings have been available in two different formats: Baymard’s six research studies (report & benchmark) and our client-specific UX audit service. Today we’re adding a 3rd format. Starting today, we’re offering Baymard’s 28,000+ hours of e-commerce UX research as 1-5 days of E-Commerce UX Training workshops and certification. The UX training is available Jan-Mar 2018 in the US and Europe (or anytime at your company offices via in-house training). These fast-paced and immersive workshops provide you with direct access to Baymard’s research team and its 28,000+ hours of e-commerce UX research. At the workshops, Christian Holst – research director at the Baymard Institute – will share the distilled findings from Baymard’s large-scale e-commerce UX research, and experiences working with clients like Etsy, Office Depot, Sears, Nike, John Lewis, Carnival, T-mobile, etc. There are 5 different topics for each of the 5 workshop days, which in combination cover the full e-commerce experience: Homepage & Category Navigation, On-Site Search, Product Pages, the Checkout Process, and Mobile E-Commerce. The UX training will be “hands-on” where you work on applying all findings to your own site (or a client’s) — giving you tangible results to bring back home. For this reason each workshop day is limited to 30 seats. At each workshop day there will be 2–3 senior Baymard UX researchers available – with at least 1 Baymard researcher per 10 attendees. This ensures you get as much direct feedback as possible from Baymard. 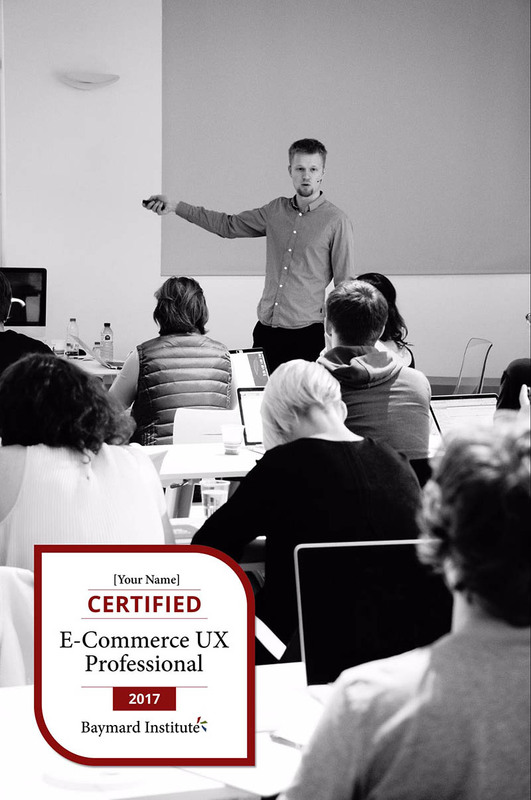 Certification: Anyone who passes an optional exam for each of the 5 workshop days will become a ‘Certified E-Commerce UX Professional by Baymard Institute’ and get an optional profile page at Baymard.com. Bonus: For each of the workshop days, Baymard’s corresponding research report & benchmark is included free of charge with the training tuition – as we’ll be using the reports and Baymard Pro access as part of the course material (this is otherwise a $200-$250 purchase per study). Besides the public training workshops, we also offer In-House UX training – where Baymard comes to your offices, at a time that suits you. This is good for those wanting private UX training and are often cheaper than public workshops if at least 5 employees will attend. Don’t wait too long as there are just 30 seats available for each location, and there’s an ‘Early booking’ discount. Authored by Baymard Institute. Published on September 5, 2017.